I never thought that having a coffee maker can be so dangerous. Dangerous in terms of having your computer hacked while making your coffee. Is that possible? 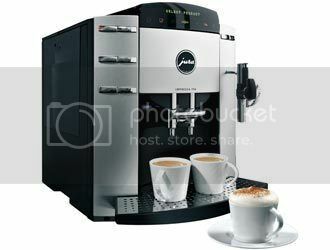 Apparently, it is since this Jura F90 is fully internet compatible and its settings and the strength of the coffee can be controlled over the internet. Another feature is getting remote diagnostic help over the Internet without having to send the appliance in for service. An Australian IT security specialist has discovered a number of security flaws after hooking up his coffee percolator to the web. Craig Wright issued a warning to internet users about the dangers of so called 'web-enabled' appliances. A number of unpatched security flaws in the unit could allow a hacker to infiltrate a network or take over the machine by using it as a 'bridge'. Interned connected coffeemakers and Refrigerators may be the trend towards the future but right now I am happy making my coffee without the internet. Especially for its price, almost $2000 in Amazon, I would rather skip this model first. Although the concept is smart and very convenient, I would like for them to fix all the bugs, glitches and make this more secure for the consumers first before I buy. I guess that would take awhile, not because they won't be able to do it but more because I do not have that much disposable income YET (Let's all get there!). A gentle touch on the operating panel is sufficient for the sensors to detect your coffee wishes from your fingertips. Easy Select© offers coffee à la Carte to suit your personal taste. The touch screen offers nine programmed coffee specialities, the Easy Select has two aroma levels and two temperature stages. To enable the eye to share the pleasure, cup illumination puts perfect coffee in the right light at all times.